What is Money and How Does One Measure It? Here is a description I pieced together from a few re-ordered sentences of Rothbard's classic text: What Has Government Done to Our Money? All sorts of criteria have been put forward: that money should move in accordance with population, with the “volume of trade,” with the “amounts of goods produced,” so as to keep the “price level” constant, etc. The online book is a great read and I highly recommend reading it in entirety. The key point above is that an increase in money supply confers no overall economic benefit. Over time, money simply buys less and less. At any point in time, however, when demand for money increases (people want to hold it as opposed to buy goods and services) prices of goods and services decline decline. This can happen even as money supply increases. It is happening now. In a gold based economy, a measure of money would be a measure of the supply of gold. However, in a fractional Fractional Reserve system (even one based on gold) more credit can be extended (more gold lent out via paper receipts supposedly "as good as gold") than their is actual gold. Even in a fiat system where money is amazingly backed by nothing, more credit can be extended than there is actual fiat currency. This is fraudulent as well, and sooner or later a credit crisis erupts caused by inability to pay back with interest what has been lent. Indeed the entire banking system in insolvent right now. It is physically impossible to pay back all the credit that has been extended on the fiat base money supply that actually exists. How Does One Measure Money? 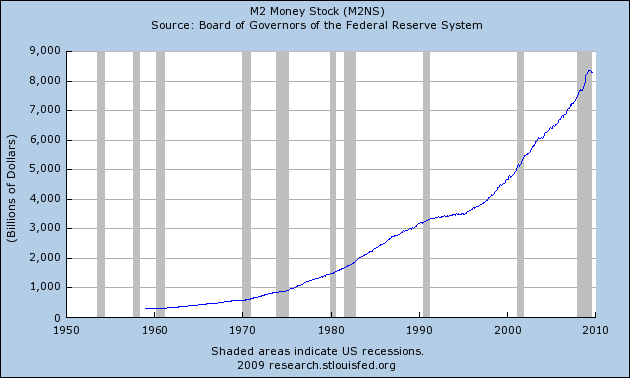 Clearly we can see from the above charts there is a huge difference between base money supply and M2. 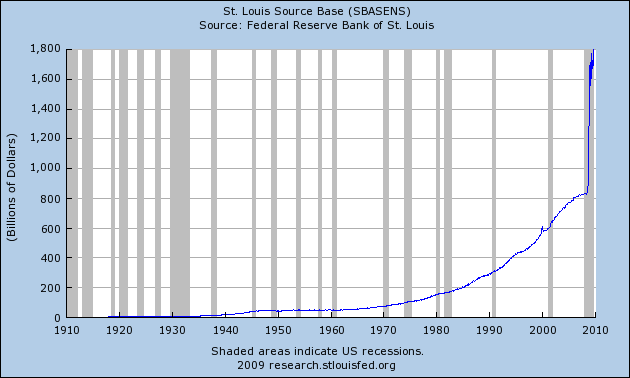 There is an even larger difference between base money supply and M3. Do any of the above measures represent "money"? Hoping to clarify the distinction between money and credit, Austrian economic followers have two additional measures, one called True Money Supply, the other Money AMS (Austrian Money Supply). I have a monetary measure called M Prime (M') but that is a representation (as best as I can put together) of Money AMS. At the heart of the entire debate is the question "How Does One Distinguish Credit Transactions From Money?" 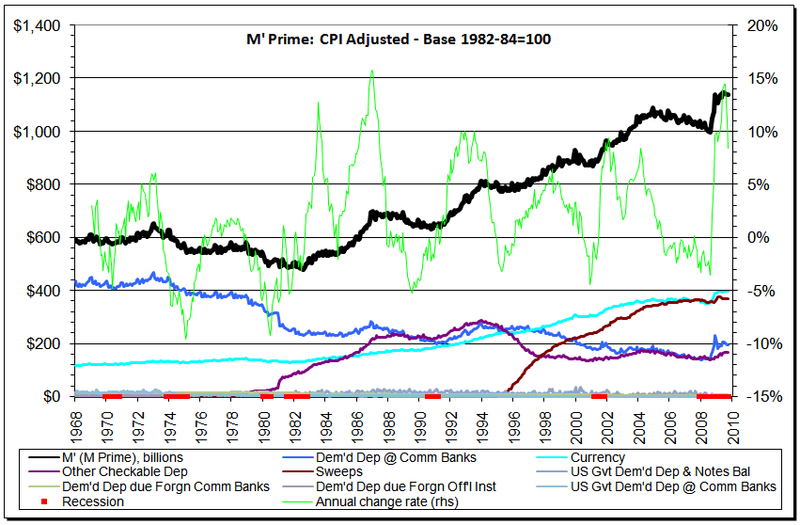 Please consider Money, Credit, Inflation and Deflation by Steve Saville. In an article posted earlier this week, Mike "Mish" Shedlock weighed in on the TMS vs. M3 discussion. Mish's article supports our view that TMS (the "True Money Supply" developed by Murray Rothbard and Joseph Salerno) is a more appropriate measure of money supply than M3, although he prefers a measure called "M Prime". The main difference between TMS and M Prime is that TMS includes savings deposits whereas M Prime does not. "Savings deposits, whether at commercial banks or thrift institutions are economically indistinguishable from demand deposits and are therefore included in the TMS. Both demand and savings deposits are federally insured under the same conditions and, consequently, both represent instantly cashable, par value claims to the general medium of exchange. The essential, economic point is that some or all of the dollars accumulated in, e.g., passbook savings accounts are effectively withdrawable on demand by depositors in the form of spendable cash. In addition, savings deposits are at all times transferable, dollar for dollar, into "transactions" accounts such as demand deposits or NOW accounts." The above argument by Saville might sound convincing. However, let's consider what Austrian economist Frank Shostak has to say in Mystery of the Money Supply Definition, also in a Mises Journal. that savings deposits do not confer an unlimited claim. The bank could always insist on a waiting period of thirty days during which the deposited money could not be withdrawn. Shostak goes on debunking MZM, MMMFs, and other measures of money. He settles on this definition: Money AMS = Cash + demand deposits with commercial banks and thrift institutions + government deposits with banks and the central bank. I concur with Shostak in regards to savings accounts. Think of it this way: Savings accounts are really lending accounts. You deposit money in a bank (transferring the claim on the money to the bank) in return for an agreed upon interest rate. With demand deposits (checking accounts) there is no transfer of claim. Nonetheless, thanks to Greenspan's allowing of banks to "sweep" customers' checking accounts into savings accounts nightly, money that should be available on demand isn't. Sweeps are automated programs that "sweep" funds from one type of account into another type of account automatically. In this case we are talking about programs that allow banks to "sweep" funds from checking accounts to other types of accounts such as savings accounts that allow money to be lent out. There are no reserve requirements on savings accounts. Sweeps were initiated by Greenspan in 1994. Take a look at the following chart to see what has happened since then. Except for the monetary stimulus of the Fed fighting the last two recessions, demand deposits have generally been in decline since 1994. 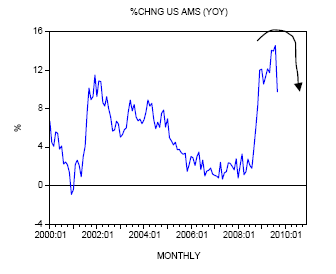 It is the only monetary component in a sustained (albeit artificial) downtrend. 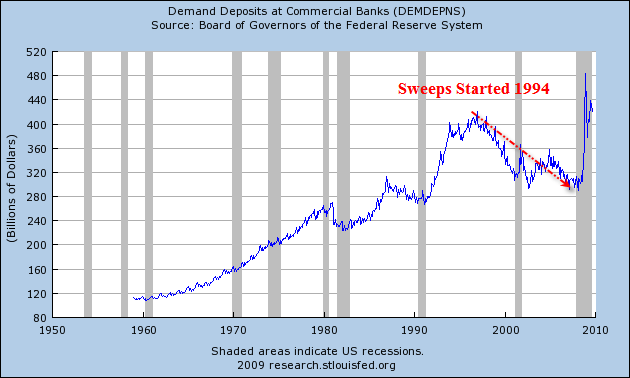 The point being, in measuring demand deposits, one must add in sweeps. 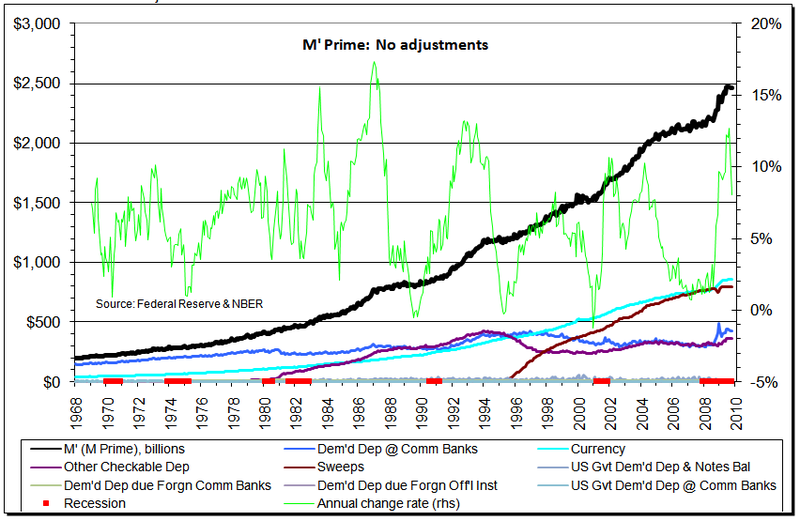 It has been a long time since I have updated M Prime, but thanks to my friend "TC" I have a couple of new charts. M Prime consists of all money that is readily available on demand. The last 4 components are so minor they barely register, appearing as a single line at the bottom of the chart. M Prime is nearly an exact match of Money AMS. I cannot account for the few subtle differences. One can construct M Prime from the components I mentioned above. The Fed hides sweeps data in an obscure online publication called swdata. Note that sweeps data is seldom less than two months old. I have no idea why it takes the Fed 2-3 months to post this data. I suppose we should be grateful they publish it at all. For the missing months, we simply extrapolate forward. A quick look shows that nearly $800 billion dollars that should be in checking accounts is missing in action. Money, supposedly available on demand, is just not there. Given there are no reserves on savings accounts, as much as $4.5 trillion people think is in their savings accounts is not there either. Moreover, the duration mismatch on savings accounts, sweeps, and likely even CDs is massive. If even 20% of the people tried to get their money out the system would freeze up. The banking system is clearly insolvent. Such is the folly of fractional reserve lending. For a further discussion of money, derivatives, and invisible debt, and the monetary crisis we are facing, please see Janet Tavakoli on Financial Meth Labs. This concludes the first half of the discussion. Thanks again to "TC" for the charts, and a huge thanks to Frank Shostak for Money AMS and also to Steve Saville for their parts in the discussion. In the second component we will take a look at which, if any money supply measures are a valid measure of inflation.